Viola Smith turns 101 this month. As the oldest member of Local 802, she has an important lesson to teach all of us: never lose your groove! We have a living legend in our ranks. 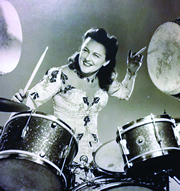 At 100 years old, Viola Smith – who was one of the first professional female drummers and was called the female Gene Krupa – is probably the oldest active member of Local 802. (In fact, she turns 101 this month, on Nov. 29.) She first joined Local 802 in 1942. She was born Viola Schmitz in Mount Calvary, Wisconsin, where her father owned the town’s restaurant and dance hall. He made sure each child played an instrument, and the family orchestra became known as the Smith Sisters. At the time, some of the sisters were under 18, so the family had to apply to the AFM local to get permission when the underage girls went on tour. Later, some of the sisters formed a new group – the Coquettes – which became a big success. They were part of a wave of all-female orchestras that swept the scene during World War II, when many men were overseas. Around that time, she also achieved notoriety for an op-ed that she penned for Downbeat, entitled “Give Girl Musicians a Break,” imploring jazz groups and orchestras to not discriminate against female musicians. Classical training and performance were also a part of Ms. Smith’s background. In the summer of 1948, she earned a scholarship to Juilliard and won a seat in the Juilliard Symphony Orchestra under conductor Walter Hendl. She studied timpani first with Saul Goodman and later with Karl Glassman. In 1949 and 1950, she played percussion with the National Orchestral Association under Léon Barzin. In 2000, Ms. Smith was featured in a New York Times story on “all-girl bands.” That same year, she was among eight musicians honored at Lincoln Center in a tribute to women legends in jazz. If you want to see Ms. Smith on video, just plug her name into the Internet and you’ll see she’s still as sharp as a tack. Local 802’s recording rep Bob Pawlo recently called up Viola Smith to ask her about her astounding career. 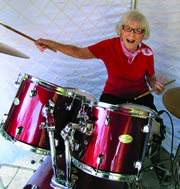 Viola Smith in her working days as a top-tier drummer. Bob Pawlo: When exactly did you begin playing music? Viola Smith: My seven sisters and I each started playing the piano when we were five and six years old. My two brothers also practiced piano – until they overheard Dad say that he had an all-girl orchestra in mind! We had two pianos and an organ to accommodate this arrangement. By age 11, I was playing drums. BP: Were you from a musical family? VS: Yes. Dad was a cornet player in a seven-piece orchestra until he was married. Mother had a beautiful singing voice. BP: What got your interest in the drums? VS: My dad chose the drums for me. Five older sisters had already been assigned to other instruments. I was the sixth one in the family orchestra, and Dad didn’t need drums until I came along. So by that time – fortunately for me – I became a drummer because I would have hated to have spent my life playing the trumpet; I wouldn’t have lasted at all. BP: When was your first public performance? VS: The family orchestra played for weddings in our ballroom, which also served as a theatre. It was used weekends for the shows and then during the week we’d have dances; we’d move the opera chairs along the sides of the theatre and it became a dance hall. Our ballroom was a tour stop for Chicago orchestras. When not performing, the younger members of the family would observe the festivities from the balcony. BP: In those days how were female musicians regarded by other musicians and in the business in general? VS: Well, during the summer we’d play county fairs and state fairs. In those kinds of venues, it wasn’t so unusual to see an all-girl band, because the fairs always featured the strange things that were happening in America, such as an 800-pound man. As girl musicians we were part of that – we were “strange” in the early 1920s. BP: When did you come to New York? VS: First in 1935 with Jack Fine’s “Band Box Revue” and next a few years later with the Coquettes, an all-girl orchestra that my sister Mildred and I formed after the Smith Sisters Orchestra disbanded. As the Smith Sisters, we toured the Midwest extensively, but then one sister died, others married, and it turned out at the very end we only had two sisters left who wanted to perform. So in 1938, my sister Mildred and I formed the Coquettes with other musicians who were not family. Mildred played the saxophones, clarinet, violin, bass violin and banjo. I played drums, tympani and vibraphone. The Coquettes were together for four years playing top theatres, hotels, clubs in the East and Midwest. We made several Warner Bros. shorts and we played in NYC a number of times. BP: Who were your drum teachers? VS: I started with a professional drummer, a cousin, who lived in Wisconsin near Mount Calvary. Later on when I started to travel, I would take lessons from various pit band drummers on the road. BP: I heard that you studied with Billy Gladstone. VS: I was playing on 52nd Street, and Billy was at Radio City. He invited me backstage and I saw the drum made of gold that he had built. I started to take lessons from him. When Buddy Rich and Gene Krupa came through NYC, they took lessons from Billy, too. Joe Morello also came backstage to take a few lessons. And Shelly Manne, too. Everyone wanted to be in Billy’s company; everybody loved the man. He was an outstanding person, not only a great drummer. He was considered the best in the country. BP: Tell us the story about playing at the Paramount the day your father died. VS: In 1944, I was playing with the Phil Spitalny orchestra at the Paramount, on 43rd and Broadway. On D-Day, June 6, 1944, my father died. A relative called me and told me right before my show. In the theatre Phil Spitalny had already announced me and was waiting for me to play. I didn’t play because I had fainted, but somehow I remained upright on the chair. Spitalny indicated to the horn player nearby to come over and give me a shove, which she did, and I immediately came to like a robot and played the solo like a robot. However, I did miss catching a stick that I had thrown on a drum, bouncing up high and not being caught, accompanied by an automatic thud on the bass drum. I was told later there were gasps in the audience. I had told a friend in the orchestra not to tell the others that my father had died. It was easier to make it through the performance by pretending I had not received the news. BP: I heard that you knew Frank Sinatra? VS: Yes! Frank Sinatra was working with the Tommy Dorsey orchestra at the Astor Hotel next to the Paramount, where we were playing. He and so many musicians would congregate for a late-night snack. They had large booths and we were always mingling with other musicians from other bands. At different times I was with Sinatra in the booth. And two of the times he asked me for dates, which I of course refused, not because he was married but because he was very unattractive to me. Later he became a very handsome man. When he was a handsome man, he stopped asking me for a date. It isn’t easy being a femme fatale. BP: What was the music scene like in NYC during the war? VS: Big name bands had been reduced to trios and quartets. There was a labor shortage, and that included musicians. At that time, the place to be was 52nd Street, also known as Swing Street, where some of the best small jazz bands of the time were playing every night. There were nothing but clubs and restaurants for three or four blocks. The clubs were jammed with sailors and Army boys. They had Count Basie in one place with a small group. He had reduced his group like everyone else. Playing 52nd Street gave me the opportunity during intermissions to visit the other clubs and see great performers up close. Tommy Dorsey’s drummer, Louie Bellson, came to see me three times mainly to see what I was doing with all those drums. BP: Looking back, to what do you attribute your success? You were a groundbreaking woman, in a man’s world. How was it you were able to be in that world in such a male-dominated environment? VS: It’s because I played in my eight-sister orchestra, which launched our careers. It wasn’t just a hobby like it possibly was with some other women. It was a serious thing. Even when we received special permission to have a union card – that was very special. BP: You were such a trailblazer in so many different ways, as a musician, as a contractor, doing so many incredible different things. What advice would you give to young musicians, especially women, starting today? VS: They have a clear-cut road ahead of them now. There are fewer obstacles. Girl musicians used to have trouble getting any work at all. You had to prove yourself. You had to be heard, but how could you be heard if nobody gives you a chance to be heard? This was the situation for years and years. My work came to me very naturally because the Spitalny orchestra needed a girl drummer; there weren’t many bands looking for a girl drummer. I had a better deal because I had the family orchestra. I always had a job, like the Coquettes, which was an offshoot of the family orchestra. We had some very important dates for the band in big theatres around the country. But this all happened naturally because I came from the family orchestra. The work was just laid out for me. I didn’t fight for it. But all the girl musicians outside of that had a problem, a real problem. BP: You will turn 101 this month. What are some of your secrets to your longevity and success? VS: I would attribute it to drinking wine. I went to Europe for two summers and got into the wine-drinking habit. There is a community in southwestern France where a lifespan of 100 years is very common. I drink one large glass of wine daily. I also take vitamins – in moderation. In all my drumming years, I’ve only missed one performance and one rehearsal, when glass fell from a second-story window and hit my wrist. BP: After many years in New York City, you moved to California. VS: I came here to California in November 2011 to visit a cousin, Marie Kolasinski, and I am still here after two years! I live here with the Piecemakers in Costa Mesa. They produce patchwork quilts and other grassroots arts, which are sold in 22 countries around the world. They are a country store with gifts, fabrics, notions, classes in quilting and other crafts, as well as a full service construction company. BP: Any closing words of wisdom for Local 802 members? VS: Local 802 always took good care of me and it’s a wonderful union. Of course I couldn’t have attained this without the union. You have to be a union member. So it’s a good union and thank God for it. It helped me get this far. To request the full version of this interview, please e-mail Allegro Editor Mikael Elsila at allegro@local802afm.org.